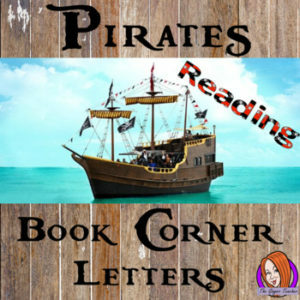 This download includes fun pirate themed book corner lettering for your reading corner display for your classroom. These are great for teachers and kids to have a pirate room. • Please go to your My Purchases page (you may need to login). Beside each purchase you’ll see a Provide Feedback button. Simply click it and you will be taken to a page where you can give a quick rating and leave a short comment for the product. Each time you give feedback, TPT gives you feedback credits that you use to lower the cost of your future purchases. I value your feedback greatly as it helps me determine which products are most valuable for your classroom so I can create more for you. • Look for the green star next to my store logo and click it to become a follower. Great! You will now receive email updates about this store. ← Something New and Exciting to Share Because We Teach So Hard!